Pellevé is a globally recognized method of reducing wrinkles and improving skin tone. The Pellevé system of firming the skin and reducing wrinkles offers an effective option for patients to reverse the signs of aging of facial skin without the use of needles, surgery or a long time of recovery after the treatment. The system reduces flaccidity and wrinkles, slowly heating up the deep layers of the skin using the heating device, powered using advanced technology that uses radio frequencies. 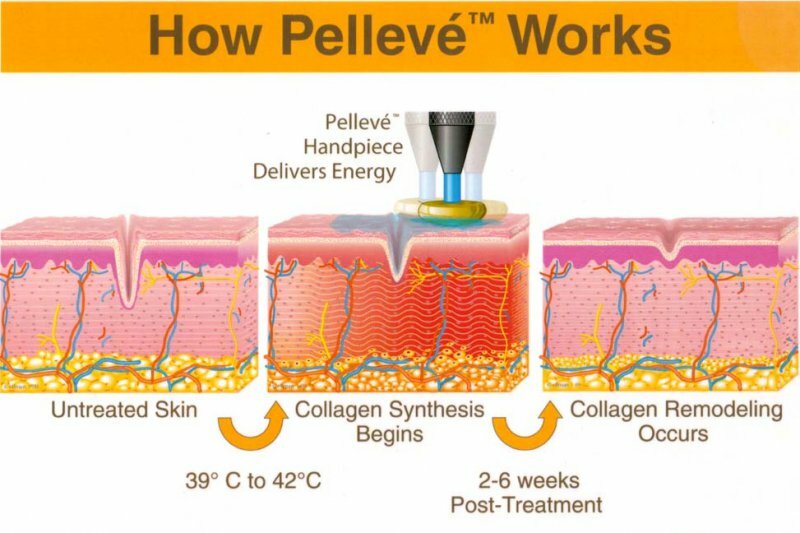 Pellevé technology precisely delivers energy to the skin tissue, inducing a tightness of collagen fibers without damaging the surface layer of the skin. After the start of collagen synthesis, skin becomes younger, both in appearance and to the touch. Collagen remodeling takes place during the period from two to six weeks or longer, and the end result is a noticeable improvement in texture, quality and appearance of the skin. Pellefirm is an innovative system of firming the body and reducing cellulite. Based on the US medical technology of radio frequencies, the treatment tightens, smooths the body and reduces cellulite, it’s non-invasive and painless. PelleFirm is the latest system of RF heads for the body, combined with massage rings. The head raise tissue temperature to 45 Celsius degrees. Cooperating massage rings reduces cellulite. PelleFirm treatment is dedicated to all of the body areas, especially the abdomen, arms, thighs, buttocks. PelleFirm has a medical CE and FDA certificate and won the Prix de Beaute award for the best treatment of aesthetic medicine! The treatment stimulates the natural tissue remodeling, increases the voltage of collagen fibers, improves flexibility. Saggy skin become tighter, wrinkles become more shallow, cellulite is visibly reduced. The effect is visible after 4 - 5 weeks and maintained till 12 - 18 months. With Pellevé treatment for the eye area we treat upper and lower eyelids as well as crow’s feet. The treatment consists of entire face, upper and lower eyelids plus crow’s feet. Pellevé treatment for the upper part of the face consists of forehead and the eye area – lower and upper eyelids, crow’s feet and temples. Pellevé treatment for the lower part of the face consists of cheeks, nasolabial folds, mouth area and drooping skin around the jawline. With this treatment we treat lower part of the face ( cheeks, nasolabial folds, mouth area ), drooping skin around the jawline and chin. Pellevé treatment for the upper and lower part of the face ( forehead, cheeks, nasolabial folds, mouth area), as well as for drooping skin around the jawline, face contour and chin. Pelleve treatment for the upper and lower part of the face ( forehead, cheeks, nasolabial folds, mouth area), as well as for face contour, drooping skin around the jawline, chin and neck. Pelleve treatment consists of upper and lower part of the face ( forehead, cheeks, nasolabial folds, mouth area, eye area ( lower and upper eyelids, crow’s feet), face contour, drooping skin around the jawline, chin and neck.